Due to human activity, the global environment is undergoing significant and rapid change. To assess the scope and impact of these changes, the science of remote sensing is constantly evolving and delivering more powerful tools to observe the Earth’s surface. Over the past decade, large, freely-available remote sensing data sets have also become available. The reality of new technology combined with extensive data is that multi-temporal analysis of remotely-sensed data – the analysis of these data over time – is a hot topic. This enthusiasm was certainly evident at the recent 7th International Workshop on the Analysis of Multi-Temporal Remote Sensing Images (MultiTemp 2013, in short), in Banff, Alberta. This popular conference took place in the final week of June at the beautiful Banff Centre, despite devastating southern Alberta flooding. It was a great opportunity for remote sensing scientists and practitioners to share new and innovative applications, data processing, and analysis techniques currently being implemented. 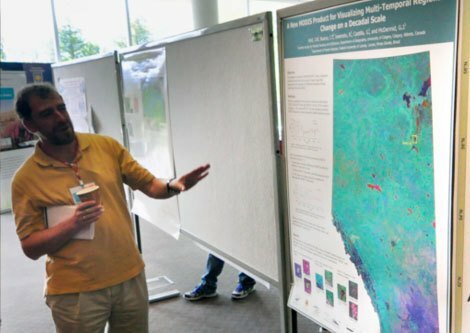 Guillermo Castilla of the ABMI’s Remote Sensing Group showcases their new, state-of-the-art visualization product: the Alberta Decadal Change Image. 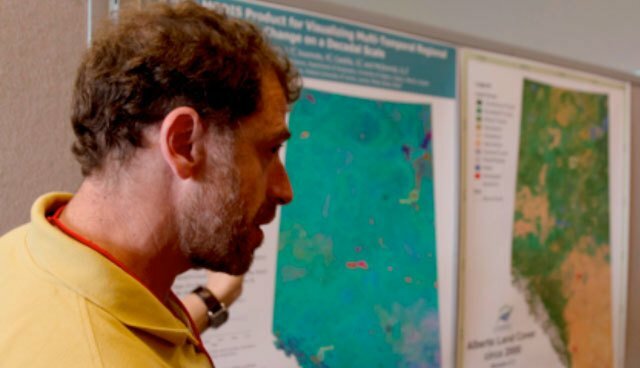 The ABMI’s Remote Sensing Group – Greg McDermid, Guillermo Castilla, and Jennifer Hird – based out of the University of Calgary played an instrumental role in organizing the conference. They also used the opportunity to showcase their new, state-of-the-art visualization product: the Alberta Decadal Change Image. The Alberta Decadal Change Image synthesizes a decade of satellite imagery (MODIS 250-metre vegetation index data) into a single false-colour visualization of provincial landscape change. The Image was a hit and garnered significant interest from academics, resource managers, and government representatives alike. It clearly shows the impact of cutblocks, oils sands development, and wildfires on the landscape, as well as vegetation regrowth and the results of reclamation efforts. Hird, in a presentation to the full conference delegation, described the Alberta Decadal Image and demonstrated its utility in quantitative analysis – i.e., quantifying landscape changes, in addition to simply visualizing them. Hird used a case study of urban expansion in the Calgary area to show how the Image can be used to better isolate areas of new urban development from other local landscape changes over more traditional remote sensing change detection approaches. The results highlight the value of this simple, yet effective product for understanding long-term change on the Alberta landscape. The Decadal Change Image was also a focal point for discussion at the poster exhibition where Castilla fielded numerous questions from interested delegates. Another major highlight of MultiTemp 2013 was the Oil Sands and Environmental Monitoring Panel discussion. As a panelist, the ABMI’s Executive Director, Kirk Andries described the vital role multi-temporal remote sensing plays in ABMI’s scientific analysis. In general, the ABMI uses remote sensing as a tool to examine habitat and human footprint across the province. ABMI’s remote sensing data sets are obtained using a variety of approaches and scales, from highly-detailed air-photo interpretation to regional-scale, satellite-based mapping. The data collected helps the ABMI monitor and report on the status of Alberta’s landscapes. Andries also emphasized the need bring together remote sensing scientists with land managers, policy makers, and industry stakeholders to ensure successful knowledge translation between all parties. Bridging the knowledge gap became a leading topic of discussion between panelists and delegates during this session, with both sides agreeing that greater communication and collaboration is needed between the groups if responsible resource development is to be realized. MultiTemp 2013 clearly demonstrated that the field of multi-temporal remote sensing is growing rapidly, with the numbers of researchers, practitioners and users in the field multiplying quickly. The conference itself has become increasingly popular. The first MultiTemp took place in 2001 (in Trento, Italy), and though international in scope, it was seen as a very specialized, unique gathering. Since then, the conference has expanded to include a larger number and wider range of delegates. Going forward, the ABMI will certainly continue to participate in MultiTemp, as well as contribute to the field, particularly with regard to much-needed practical, operational-level applications. Remote sensing can be defined as the collection of information about an object or phenomenon, without being in contact with it. Here, the term primarily refers to the observation and study of the Earth’s surface through satellite-borne remote sensors that record levels of energy reflected or emitted by the Earth.